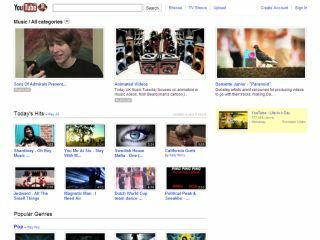 YouTube has re-created its music landing page, specifically designed to help users find the playlists they want quicker and easier. The all-new page features different sections for each genre of music including Today's Hits, World Music, Religious, R&B and Soul, Rock, Classical, Rap and Hip-Hop, Country and Folk, Electronic and Pop. The site allows users to listen to an 'instant playlist' of their desired genre of music. Possibly now the easiest place to watch your favourite music videos, the new YouTube page has a list of added extras including special promotions, most viewed music, unsigned talent and curated playlists. YouTube's blog also reveals plans to launch an 'events near you' section, featuring upcoming live shows based on the users location.